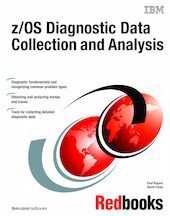 This IBM Redbooks publication describes problem diagnosis fundamentals and analysis methodologies for the z/OS system. It provides guidelines for the collection of relevant diagnostic data, tips for analyzing the data, and techniques to assist in identifying and resolving of Language Environment, CICS, CICSPlex/SM, MQSeries, VTAM, and DB2 problems. Also described are some diagnostic procedures that are not purely z/OS, but that are related to the various platforms (UNIX and Windows) where IBM software executes and interacts with z/OS in a Client/Server or distributed framework topology. Diagnostic data collection and analysis is a dynamic and complex process. This book shows you how to identify and document problems, collect and analyze pertinent diagnostic data and obtain help as needed, to speed you on your way to problem resolution. Chapter 2. What version/release am I running?